This glorious basket of beautiful blossoms will send hope and let those you care for know that grief is a path they needn't walk alone. 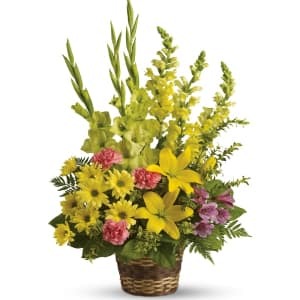 • Bright flowers such as yellow asiatic lilies, snapdragons and daisy spray chrysanthemums along with green gladioli, purple alstroemeria and fresh greenery are beautifully delivered in a natural basket. 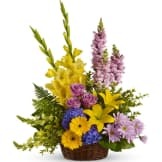 • Arrangement measures approximately 19" W X 30" H.
Flowers will be received by a A.E. Grier & Sons Funeral and Cremation, LLC. 's staff. We were very pleased with this floral arrangement. The size and colors were exactly as pictures. No problems getting my flowers ordered for a recent funeral. I did not get to attend, but I am sure the flowers were beautiful. Thank you sympathy store. I will use you again. Thanks for delivering as expected. Flower arrangement wasn't exactly as shown, but was very pretty. Looked just like the photo of the flowers on the website. All set up at the funeral home. Beautiful! I ordered this for my husbands Grandmother, for her Rosary and funeral . The bouquet was magnificent and so much larger than I was expecting. Very pleased with this service, makes it so easy to get flowers to the services! I sent these flowers for a very sad occasion to a friend who lives out of town so I never had a chance to see them. The reports from the family were that the flowers were lovely. 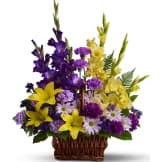 Thank you Sympathy Store for making it effortless to send a beautiful remembrance to a very loved friend. All of our flowers are designed and delivered by hand from a local florist in in Charlotte.